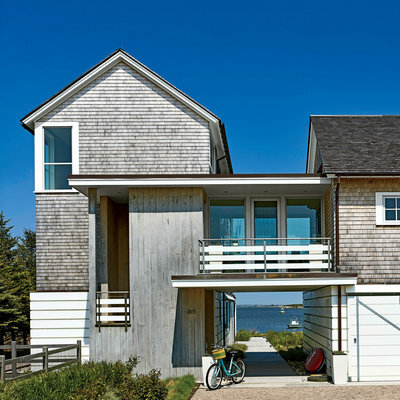 An architect puts a new spin on the classic shingled Rhode Island beach house. The result? A modern stunner that meets new flood requirements and takes advantage of its gorgeous seaside setting. The design of this Charlestown, Rhode Island, beach house honors the farm buildings and Cape Cod-style summer cottages that have inhabited the nearby rockbound peninsulas for hundreds of years. “It’s inspired by that old coastal architecture, but the two-building design is an updated take,” says architect James Estes, who designed the smaller wing (situated parallel to the shoreline) for cooking, dining, and living and the larger, two-story structure for bedrooms, and then linked the companion structures with a glassed-in breezeway. Estes’ two-building twist on the classic shingled barn ensures that nearly every space in the house takes advantage of the site’s killer salt pond views. A grassy lot that stands yards from Ninigret Pond, a tidal body protected from the ocean by a barrier beach. Oysters and quahogs populate the shallow waters, and kayaks bob along its serpentine shoreline. Light floods the contemporary, loft-like interior, and syncs well with the “faded, barefoot palette,” saysdesigner Anne Hardy. “During summer, the light is filled with the blue of the water and green of the grasses. We wanted to bring some of that inside,” she says, adding that the natural harmony adds warmth to the sunny rooms. In place of a traditional fireplace for chilly evenings, the team opted for a more modern freestanding direct-vent heater. Outdoors, a stone fire pit helps keep the deck cozy. Get the Look: A floating vanity and a soaking tub give the master bath a spa-like feel that syncs with the serene pond setting.